1 1. What are Primary Care Teams? 3 3. How Patients Are Transferred From Acute Care To Primary Care? 1. What are Primary Care Teams? Other more alternative services such as a podiatrist, a chiropodist, Acupuncturists etc may also be present. The PCT most often consists of a GP, a Nurse and a Physiotherapist while many of the other professions split their time between two or more teams. This seems to be very common with Occupational Therapists in particular. Primary Care Teams should ideally be housed within the same complex where they could easily refer and consult on different cases, this however appears to be more difficult than first imagined as many Physiotherapists who work in the community find themselves working alone and sometimes without an office/base for their practice. The HSE, which is the driving force behind this initiative hopes that PCTs will ultimately care for the rehabilitation of patients within the community following a hospital visit saving them from returning to hospital on a regular basis for after-care. The HSE currently has 222 active PCT around the country, though it is hard to know which of these are working at maximum efficiency as it appears that some do not have a base/centre to work out of. There are plans to have 530 teams formed by 2011. Having spoken to a number of Physiotherapists who work in a Primary setting I feel that PCTs could potentially be very beneficial. A problem with the system as it is now is that there is very little consistency. In a PCT all professionals have access to the patient’s history and could potentially make a more accurate, team-based diagnosis and management plan. For a PCT to function at this ideal capacity it must be laid out correctly in one centre or complex where there are one set of patient notes. Currently there appear to be many PCTs which do not have this facility and therefore are forced to function as individual GPs and Physiotherapists working alone in a primary setting. Though they might refer to each other they do not function as a single team. As the aim of Primary Care Teams is to treat more patients in the community and to direct the non-acute cases away from hospitals, a lot of physiotherapists are moving out of hospitals and into community settings. This is the profile of one Primary Care Physiotherapist who moved from working in an out-patient department of a regional hospital and into a community hospital. Patients: treats musculoskeletal outpatients and under 65s with disabilities. Most common conditions treated: treats mostly musculoskeletal problems such as back and neck pain. Also treats patients under 65 with disabling conditions such as MS and Motor Neuron Disease. Patients referred by: GPs, Public Health Nurses and Consultants. Patients cannot self-refer. Patients who have had surgery in private hospitals often ring up to make an appointment as they have been given exercises to do at home but have not been referred to any physiotherapist. In these cases, the patients are told to go to their GP. The GP will then refer them to the physiotherapist and pass on the patient history. Interactions with other health care professionals: Communicates with Occupational therapists, GPs and public health nurses when needed. Where patients are treated: treats most patients in the community hospital physiotherapy department where they are based. Patients treated in homes very rarely. How workload is structured on a daily basis: tries to treat 2/3 new outpatient referrals a day and 6/7 review slots. It is the aim to leave one afternoon a week free for treatment of disability patients. Working hours per week: works 9 - 4.30 Monday to Friday. On call situation: not ever on call at the moment but will be. • Staff not as accessible as in hospitals and continuous professional development is difficult. • Had 9 DNAs in 22 treatment days in the last month. Patients are more likely to attend private physiotherapy appointments as they are paying for them. • Having Occupational therapists which are treating your patients nearby. • Having your patients GPs nearby if you need to refer. • Having more time with your patients. • The environment is not as intense as in hospitals. All paediatric conditions, acute neurological conditions, fractures, falls of the elderly. At the moment 80% of referrals are seen within 8 weeks and all referrals are seen within 12 weeks. 3. How Patients Are Transferred From Acute Care To Primary Care? 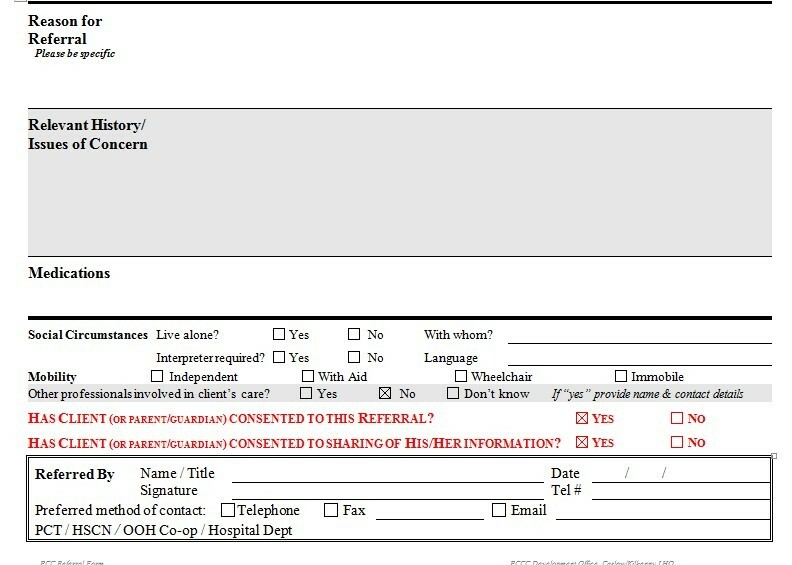 When a patient is treated in the hospital by a physiotherapist, and he/she is deemed to required further ongoing physiotherapy input in the community settings after being discharged home, the physiotherapist in the hospital will send a referral by post or tax to an appropriate community physiotherapy centre. Patients must be deemed medically stable prior to sending referral to community services. 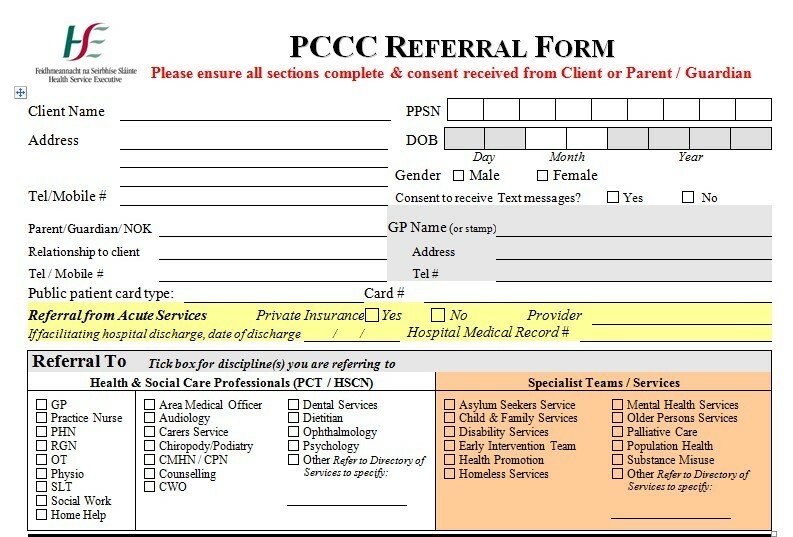 In the hospital setting, physiotherapists complete a HSE PCCC (primary, community and continuing care) referral form (see attached), and send it to a community centre based on the patient's address, which are allocated to certain catchment areas. In the HSE PCCC referral form, physiotherapists in hospital setting will give detail of patents to their community colleagues as to what type of physiotherapy intervention will be need. For example, balance classes or mobility re-education or strength training. Community physiotherapists then prioritese the referral based on the information that acute care physiotherapists provided. The patients are then assessed in their own home or else in a community health centre if the patient can organise their own transport to get to the centre. A primary care physiotherapist will usually spend 3 days a week working in their clinic and 2 days on home visits to patients. If possible patients are brought to the clinic allowing less time being spent travelling and more equipment being available for assessment and treatment in the clinic . Included is their weekly meeting with other members of the multi-disciplinary team. Some of this time is also given to health promotion in their community, such as school visits. Caseload is varied and work in all the different areas, mostly they deal with musculoskeletal injuries in patients who have recently been discharged from hospitals. Review of patient at home following discharge from acute services post CVA. Provide advice for patients and their families regarding manual handling, safe and effective transfers from place to place, positioning and reviewing home exercise programmes provided by physiotherapist in acute services. Promoting things like healthy eating, exercise, back care advice, posture and cardiovascular health in their communities. E.g. In Castleisland, Co. Kerry, there was found to be a high incidence of prostate disease among men in their 50’s and 60’s. It was founds that many of these men would not visit their G.P regularly. The primary care team decided to hold meetings at the weekly cattle mart to give them access to their target audience. They provided health advice to these men and allowed them to take blood tests. Gout re-education, mobility advice and education and prescription of walking aids, falls prevention advice and tips for a safe environment, advice regarding osteoporosis, staying active and referral to O.T for assistive devices such as reaching devices also arrangement of home help for elderly. Much of the home visits are to elderly patients with the home of making their ADL’s easier. A recently discharged patient from acute services 5 days post op following total hip replacement was referred tp physiotherapy, 70 year old male. Patient was discharged early due to presence of primary care team in living area. Walking with elbow crutches at present. -Reviewed his home exercise programme and advised on its importance. -Reviewed hip precautions and spoke to wife about it, gave handout as patient had misplaced his total hip replacement booklet. -Assessed the environment and advised on adequate lighting and removing rugs from floor to decrease risk of falls. -Reviewed patient walking on stairs, made sure it was safe. -Liased with O.T regarding bath chair for shower, other required equipment. -Advised patient on time scale regarding weaning to one elbow crutch. -Arrranged follow up appointment in clinic in 6 weeks to progress home exercise programme and review mobility progress. After one month from appointment patient was mobilising independently and was discharged from physiotherapy.